From ""I have a headache"" to ""I don't remember that,"" studies show that most of us lie once or twice a day. While some lies are considered ""white lies,"" other lies can destroy relationships, careers, and lives. 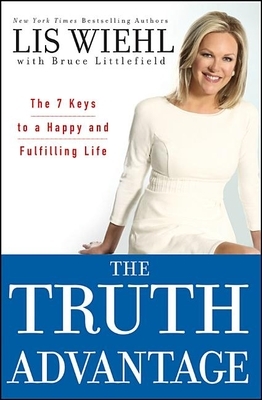 In this helpful and fascinating book, Lis Wiehl shows just how and why the truth is a powerful tool. Using news stories, court cases, and personal anecdotes, she teaches you the seven ways to unlock the Truth Advantage and gives you practical techniques to improve all aspects of your life, from your job to your relationships. This book will also equip you with your own personal lie detector--the secret to finding out when people are not telling you the truth--and then gives you advice on precisely what to do when that happens. Lis Wiehl shares her knowledge as a lawyer and news commentator (and the daughter of an FBI agent) to help you sort through the lies and get to the truth. When you tell the truth and can get the truth from others, you are well liked and respected and your life is happier. This book will help you become the best, most powerful person you can be by using one uncomplicated tool--the Truth Advantage. Lis Wiehl is a "New York Times" bestselling author and one of the nation's most prominent trial attorneys and highly regarded commentators. Wiehl is the legal analyst and contributor on the Fox News Channel and Bill O'Reilly's sparring partner in the weekly "Is It Legal?" segment on The "O'Reilly Factor." She hosts "Wiehl of Justice" for Fox News affiliates and her column "Lis on Law" appears weekly on FoxNews.com. Lis Wiehl has been a guest on shows such as "Dr. Phil," "The Early Show," and the "Today Show. "Bruce Littlefield is a "New York Times" bestselling writer and lifestyle expert. He has appeared on the "Today" show, "The Early Show," and "The View." Visit him at brucelittlefield.com.